Stomatitis is an inflammation of the lining of any of the soft-tissue structures of the mouth. It is usually a painful condition, associated with redness, swelling, and occasional bleeding from the affected area. The inflammation may be caused by conditions in the mouth itself, such as poor hygiene, from burns from hot food or drinks, or by conditions that affect the entire body, such as medications, allergic reactions, or infections. Children may develop stomatitis at any point in their development, from infancy to adolescence . The two most common types seen in children are herpes stomatitis, which is caused by the herpes simplex virus, and aphthous stomatitis, more often referred to as canker sores . Though stomatitis may occur at any time during a child's growth, different types affect children at different times. Herpes stomatitis can occur anywhere between six months and five years of age but is most common in children one to two years old who have not been exposed to the herpes virus before. Aphthous stomatitis begins in childhood or adolescence, with peak onset in those aged ten to 19 years. Aphthous ulcers may be more common in females than males. Children of higher socioeconomic status may be more affected than those who are from lower socioeconomic groups. A number of factors can cause stomatitis. Cheek biting, braces, or jagged teeth may persistently irritate the oral structures. Chronic mouth breathing due to plugged nasal airways may cause dryness of the mouth tissues, which in turn leads to irritation. The cause of herpes stomatitis is the herpes virus type 1 (not to be confused with genital herpes, which is caused by the herpes virus type 2 and is a sexually transmitted disease). The cause of aphthous stomatitis is unknown, although several factors are suspected. There may be an inherited tendency to develop canker sores and there may also be an immune system link. In addition, they may be triggered by emotional stress; nutritional deficiencies of iron, folic acid , or vitamin B12; menstrual periods; food allergies ; or viral infections. They may occur with no identifiable cause. If the child appears dehydrated, parents should seek immediate medical attention. Signs include dry lips, the absence of tears when crying, a sinking soft spot on an infant's head, and no urination in eight hours or very dark urine. Parents should also seek care if the child is very weak, tired, or difficult to waken. Stomatitis is diagnosed by the doctor based primarily upon the appearance of the mouth sores. 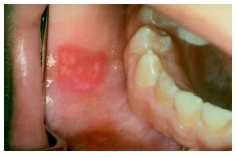 Both herpes and aphthous stomatitis have lesions that are unique in appearance. Although laboratory studies are seldom performed, the physician may order further blood tests or cultures of the lesions in order to confirm the diagnosis and rule out other causes. The treatment of stomatitis is based upon the problem causing it. For all types, local cleansing and good oral hygiene is fundamental. Sharp-edged foods such as peanuts, tacos, and potato chips should be avoided. A soft-bristled toothbrush should be used, and the teeth and gums should be brushed carefully. If toothbrushing is too painful, the child should rinse out his mouth with plain water after each meal. Local factors, such as sharp teeth or braces, can be addressed by a dentist or orthodontist. In herpes stomatitis, the most important part of treatment is for parents to keep their child drinking as normally as possible. Bland fluids such as apple juice, liquid flavored gelatin, or lukewarm broth are easiest to drink. Sucking on a Popsicle or sherbet may be soothing. Citrus juices and spicy or salty foods should be avoided. In the event of severe disease, the doctor may use intravenous fluids to prevent dehydration . Acetaminophen may be used for temperatures over 101°F (38.3°C) and to address pain. Medicines that numb the mouth, like viscous lidocaine or topical anesthetics only last for a brief time and, by numbing the mouth, may cause your child to further injure damaged tissues without knowing it. Antibiotics are of no help in treating herpes stomatitis. However, if the case is particularly severe, the doctor may prescribe an antiviral medication such as acyclovir which, if given at the beginning of the outbreak, may help clear things up faster. Medical treatment is usually not necessary for aphthous stomatitis, unless the ulcers are severe (larger than one centimeter or lasting longer than two weeks). In this case medical evaluation and treatment may be indicated, and topical or oral tetracycline may be given. However, tetracycline is usually not prescribed for children until after all of their permanent teeth have erupted, as it can permanently discolor teeth that are still forming. Avoid hot or spicy foods to minimize discomfort. Mild mouth washes such as salt water or over-the-counter mouthwashes may help. Over-the-counter topical medications applied to the ulcerated area may reduce discomfort and sooth the area. To prevent bacterial infections from developing, parents should encourage their child to brush and floss teeth regularly. Placing a spent tea bag on a canker sore may provide comfort. Sodium lauryl sulfate (SLS), a component of some toothpastes, is a potential cause of canker sores. In one study, most recurrent canker sores were eliminated just by avoiding SLS-containing toothpaste for three months. Some physicians may recommend a variety of dietary measures to treat stomatitis. These may include eating cottage cheese, buttermilk, and yogurt, as well as foods high in B vitamins . Some doctors may recommend supplementation with folic acid, iron, or vitamin B12. The prognosis for the resolution of stomatitis is based upon the cause of the problem. Many mouth ulcers are benign and resolve without specific treatment. In the case of herpes stomatitis, complete recovery is expected within ten days without any medical intervention. Oral acyclovir may speed up recovery. Most children are minimally inconvenienced by aphthous stomatitis, because attacks are usually infrequent and only last a few days. Stomatitis caused by irritants can be prevented by good oral hygiene, regular dental checkups, and good dietary habits. Because so many adults and children carry the herpes virus, and because they can pass it on even if they have no symptoms, there is no practical way to prevent herpes stomatitis. Parents can, however, discourage their child from kissing, sharing food, or playing in close contact with people who have an active herpes infection. This patient is afflicted with stomatitis, a common inflammatory disease of the mouth. Canker sores may be minimized by teaching children to avoid trauma, even minor trauma, to the mouth, such as hard toothbrushes and rough foods. If the doctor has determined that the child has a nutritional deficiency, parents can insure that the child is taking the appropriate supplements and eating the recommended foods. Avoiding stressful situations may also be beneficial. Most cases of stomatitis in children are benign and resolve within a relatively short period of time. Children with herpes stomatitis may return to school or day care when their fever is gone and the mouth sores are healed. Since aphthous stomatitis is not contagious, there is no need to curtail a child's activities unless they have developed signs of complications, such as infection. See also Canker sores . Vander Schaaf, Rachelle. "Cool Relief for Canker Sores." Parenting 17, no. 6 (August 1, 2003): 38. American Dental Association. 211 E. Chicago Ave., Chicago, IL 60612. Web site: http://www.ada.org. "Medical Encyclopedia: Herpetic Stomatitis." Medline Plus January 16, 2004. Available online at http://www.nlm.nih.gov/medlineplus/print/ency/article/001383.htm (accessed October 14, 2004). Stine, Annie. "Gingivostomatitis (herpes mouth sores)." Babycenter.com 2004. Available online at http://www.babycenter.com/refcap/toddler/toddlerills/todthroatprobs/1201460.htm (accessed October 14, 2004). Aphthous stomatitis —A specific type of stomatitis presenting with shallow, painful ulcers. Also known as canker sores. Herpes stomatitis —A form of stomatitis caused by the herpes 1 virus, usually seen in young children. Stomatitis —Inflammation of the mucous lining of any of the structures of the mouth, including the cheeks, gums, tongue, lips, and roof or floor of the mouth. this article was great! i have cranker sources and never in my life have i had them! this article really helped me learn more about it and it also let me know im not the only one with the problem!